Hey! 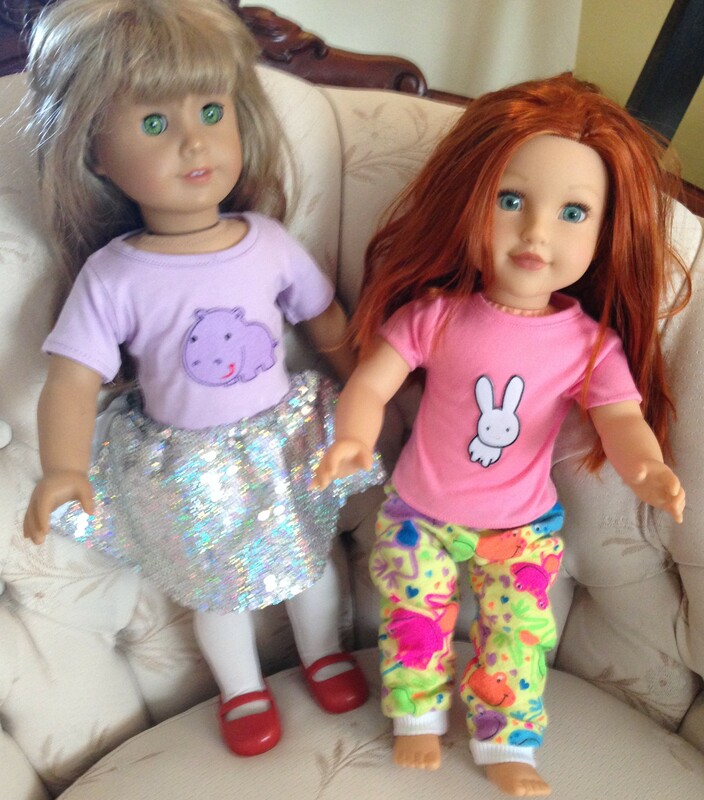 Just a quick post on what to do with all of those plain doll t-shirts that you’ve accumulated over the years. Don’t get me wrong, they are pretty cute as is, but after a while, we wanted something with a little bit more pizzazz. 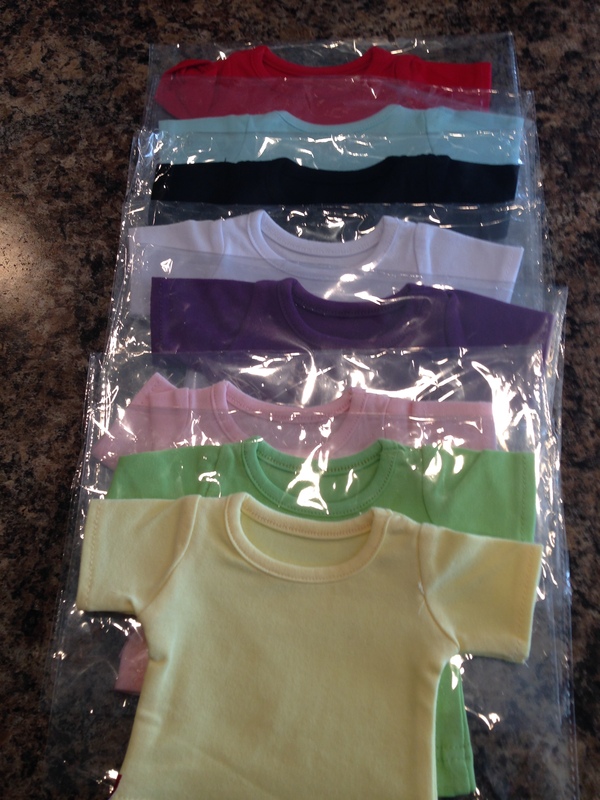 Not only did we have a bunch of random, white doll t-shirts, but I had also ordered quite a few plain t-shirts a while back in a bunch of pretty colours because they were cheap, and I thought that maybe we could jazz them up a bit. They are super plain as is, but with a little love, they turned out incredibly cute! I decided to show you how to do it too. 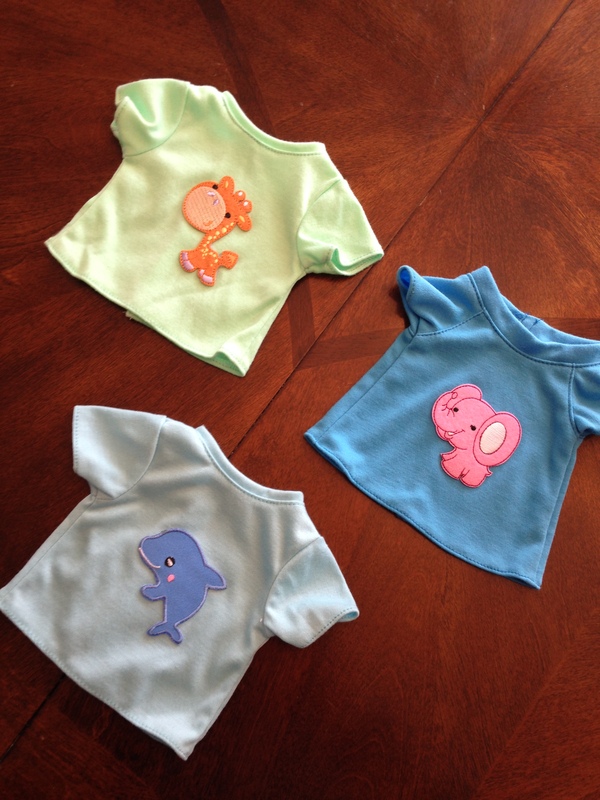 Here are some of the appliqués that we had. We just picked these up at Walmart. If you don’t have these, you could probably cut out shapes from craft foam or felt to make your own in whatever shapes you like. Then just use a marker to add the fun details. I am sure it would be just as cute. Take your t-shirt, and slip a piece of scrap cardboard in between the front and the back. 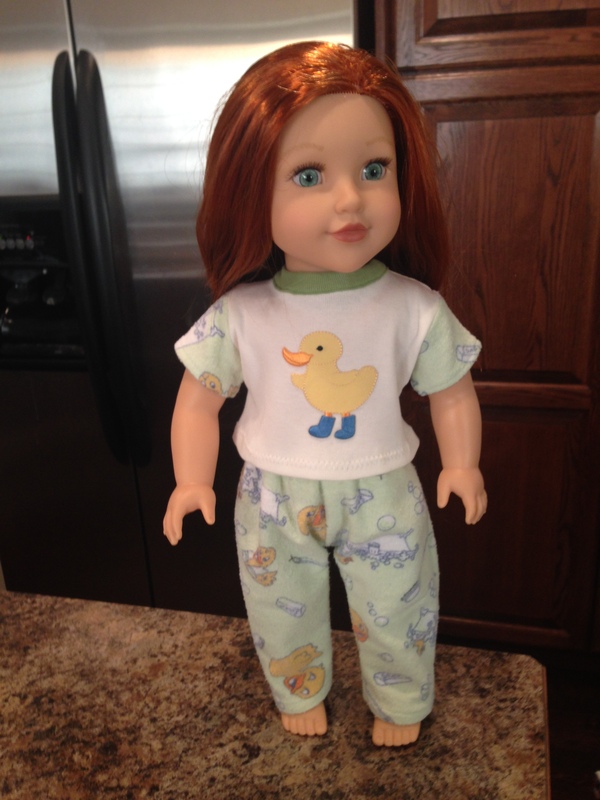 Now ours were iron on appliqués, but I figured that the doll clothes were never going to go through the wash anyway so I just used my hot glue gun instead. It makes for a very permanent hold. Be sure that you keep that piece of cardboard in there though or you might end up gluing the shirt front to the back! Decide where you want to put the appliqué, and then just hot glue it on there! Easy as that! Have fun mixing and matching the colours. It’s so fun, and the shirts become something completely different. It’s like getting a brand new shirt for your doll! Adorable! 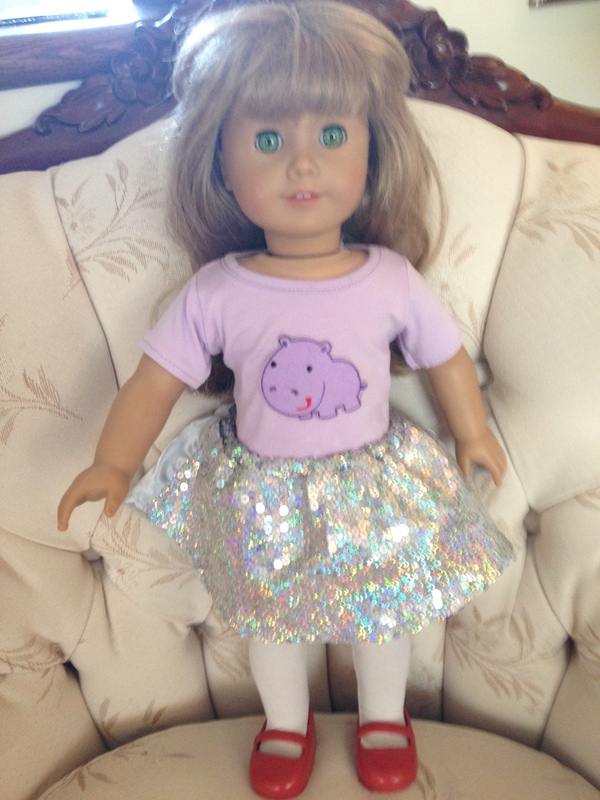 I just love the purple hippo! 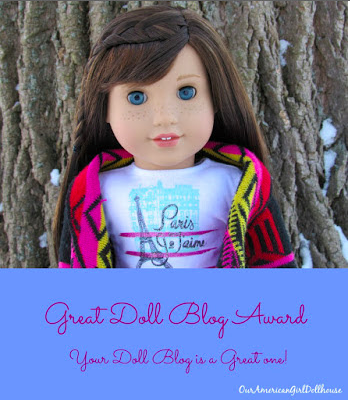 So go ahead, and take your doll t-shirts from plain to fabulous! You could hot glue some ribbons and bows on there as well if you wanted, or make a Halloween/Christmas themed shirt. Next I’m going to see if I can find some Paris themed appliqués to make some shirts for Grace. I think a 50’s inspired poodle appliqué might also be in order, just in case we want something a little more Maryellen.